Christ’s resurrection from the dead is a foretaste of the resurrection to which Christians look forward in faith and hope. Nevertheless, it is right to mourn those who have died as they pass from this life, and to entrust them to the care and mercy of God. In a Christian funeral we honour the body of the person who has died, for in their baptism it became a temple of the Holy Spirit. We pray for our departed brother or sister, commending their soul to the Lord. We comfort those who remain with the hope of the resurrection. 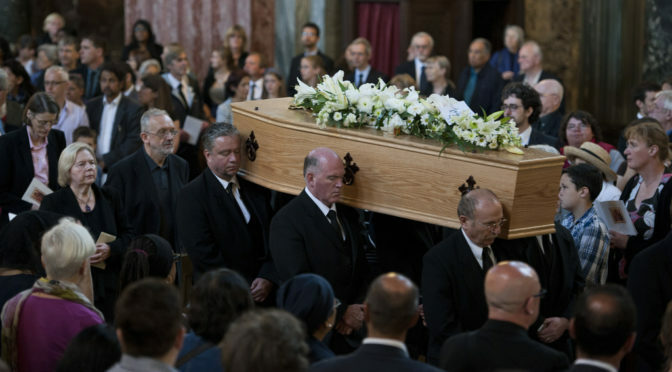 Ideally, a Catholic Funeral is not a stand-alone ceremony: from deathbed to final resting place there is a sort of “procession”, with several important moments on the way. There may be a vigil of prayer at the home of the deceased: either immediately after death, or shortly before the funeral rites. The body is then received into the church: this is often done the evening before the funeral Mass, so there can be a vigil of prayer in the church; or the reception can happen at the beginning of the funeral Mass itself. The centre of Catholic funeral rites is the Funeral Mass, where Christ’s saving death is made present once again, his resurrection proclaimed, and his body and blood received for our nourishment on our journey. The Funeral Mass ends with the commendation of the deceased to God’s mercy, and a procession to the final resting place begins. At the side of the grave the prayers of committal are said, and we take our leave of our departed loved one. Although the Church commends and prefers the ancient practice of burial as the most fitting way of honouring the body of the deceased Christian, cremation is also now permitted. In certain circumstances it might be appropriate to celebrate the Funeral Liturgy without Mass, even in a crematorium chapel. These are things best discussed with the Priest. What do I do to arrange a funeral at St Cuthbert’s? If we’re not already in touch, give us a ring on 0191 384 3442. In order to eliminate unnecessary delay or confusion, we would prefer you to be in contact with us directly, even if a Funeral Director offers to get in touch on your behalf. If you are using a Funeral Director, they will liaise between the family, the church and the cemetery or crematorium to fix a date and time for the funeral. The Priest will meet with you to discuss the details of the liturgy in terms of hymns and readings, and if necessary get to know a bit more about the person who has died. Can I have … at the funeral? Catholic funerals are liturgical celebrations of the Church. The readings must all be from the Bible, and any hymns, chants or songs must be from sources approved by the Church. The Priest can help you choose appropriately from the various options possible. Eulogies (i.e. speeches of praise for the deceased) are not permitted at Catholic funerals. The Priest will, however, try to make his homily appropriate for the person who has died. It is also possible, if desired, for a friend or a family member to speak briefly in memory of the deceased before the final commendation. Of course, the sacred rite of the funeral itself does not have to be the only commemoration of someone who has died. Secular songs, poems, speeches etc. which would not be appropriate for the funeral might well find a place in a reception afterwards. What about my own funeral? We all have to confront our mortality, and many people do give thought to their own funeral liturgy. If you are making detailed plans for a funeral at St Cuthbert’s, we would encourage you to discuss them with the Parish Priest, and, of course, make sure that your next of kin know your wishes. If you have any queries about funerals at St Cuthbert’s, please do not hesitate to contact us.